Long, dull, dry days of winter have left my skin looking red, itchy and irritated. It’s also left it feeling extra tight and dry this year. At the beginning of February, I went on the hunt researching some of the best hydrating products on the market today. Although we all think a rich and creamy daily moisturizer is enough to keep our skin comfortable, it’s only half the battle in keeping your skin healthy and happy. Everyone can benefit from a nourishing and hydrating skincare routine, myself included. I was looking for a skincare brand that could not only hydrate my skin but improve the overall appearance. 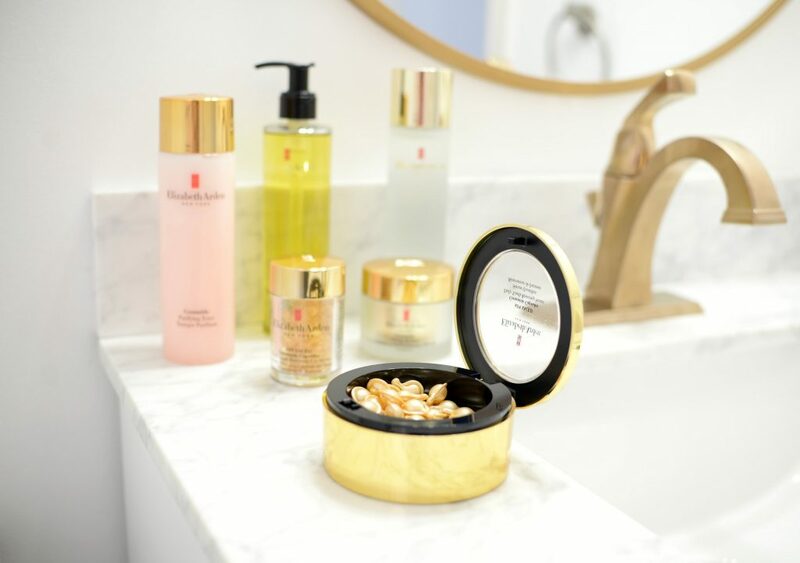 I found my answers with the Elizabeth Arden Ceramide collection. In as little as a few weeks, it completely transformed my skin. My complexion is now youthful, glowing and more radiant. Continue reading to find out which products I’ve been loving this month. 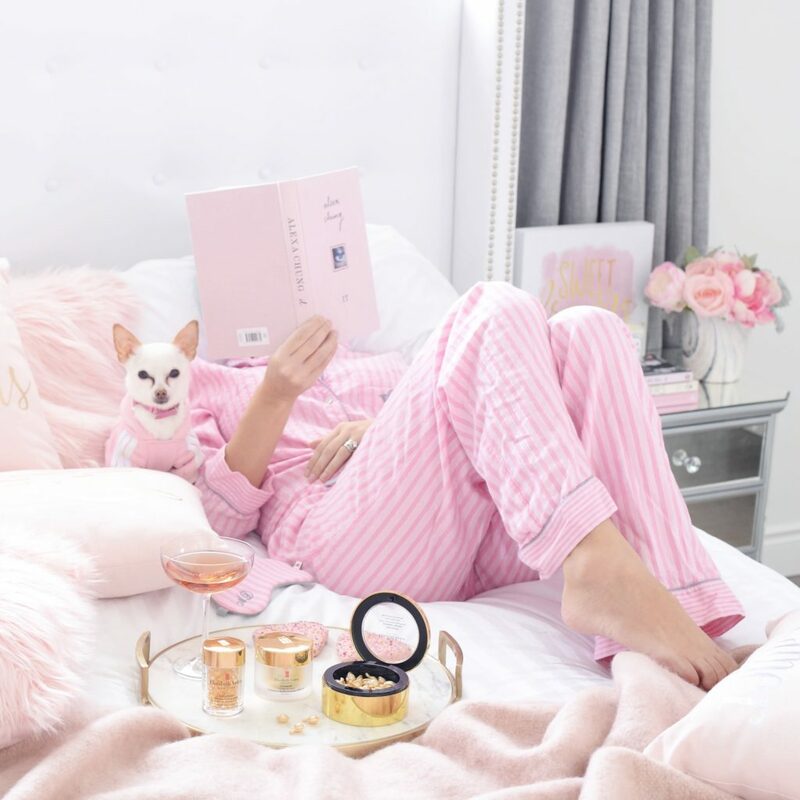 As much as I know the importance of drinking plenty of water and incorporating hydrating foods into my diet, my skin sometimes needs that extra boost of hydration…especially during the long, cold winter months. Since I wash and rinse my skin so well in the evening, I don’t feel the need to go in with a daily cleanser in the morning. Over-washing tends to strip my skin of its natural oils, leaving it feeling even more dry and dehydrated. 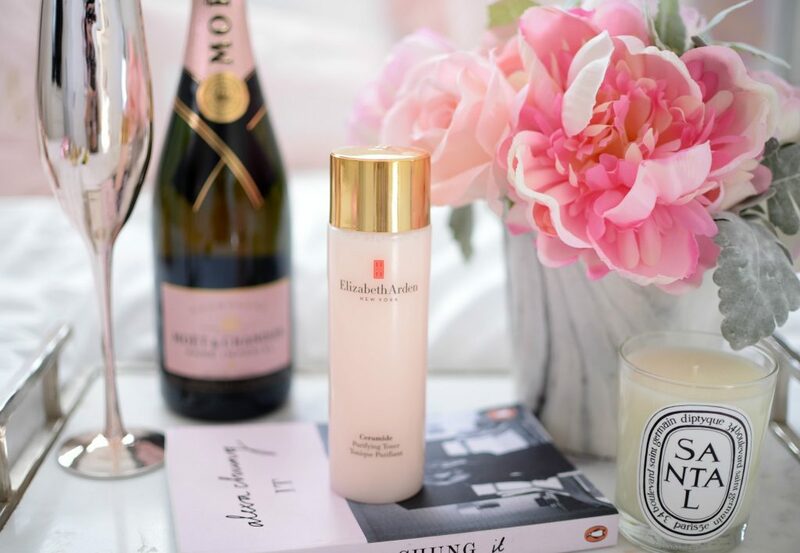 Before I have my morning cup of coffee, I start by applying a small amount of the Elizabeth Arden Ceramide Youth Restoring Essence. This water-based treatment is so incredibly lightweight, it’s the perfect product to add to any skincare routine. It’s formulated with 73 minerals, which are naturally found within your body, along with hyaluronic acid and vitamin B5, to help retain hydration, aloe vera, to help calm and soothe the skin, and a unique blend of ceramides for added moisture. Although you can apply a small amount of the Elizabeth Arden Ceramide Youth Restoring Essence to a cotton pad and then press into the skin, I find you end up wasting more product this way. I just apply a drop or two into the palm of my hand and blend into the skin with my fingertips. Its slightly water consistency almost melts into the skin, absorbing within seconds and leaves my skin more receptive to other products I apply. Don’t think of this as a toner, it’s so much more than that. Not only does it leave behind a healthy and radiant glow, it also helps to optimize the efficiency of any product you apply overtop. 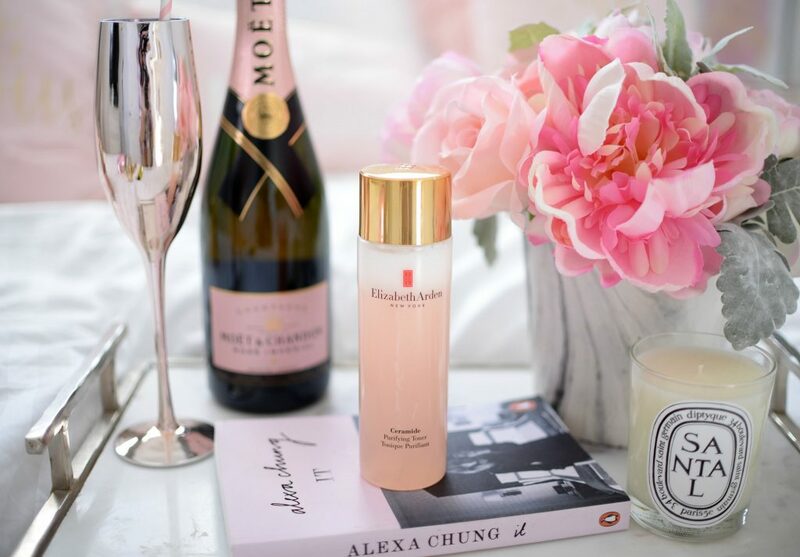 Elizabeth Arden Ceramide Youth Restoring Essence instantly helps replace moisture loss, while calming and reducing redness. It helps to soothe irritation and dryness, for all day comfort. It has a slightly cooling, almost stimulating effect that’s quite refreshing in the morning. I’ve noticed a huge improvement on how much my daily moisturizer absorbs and how smoother my foundation lays on the skin. My skin is left not only looking, but feeling soft, supple, hydrated and ready to take on the day. It retails for $73 for 140ml. 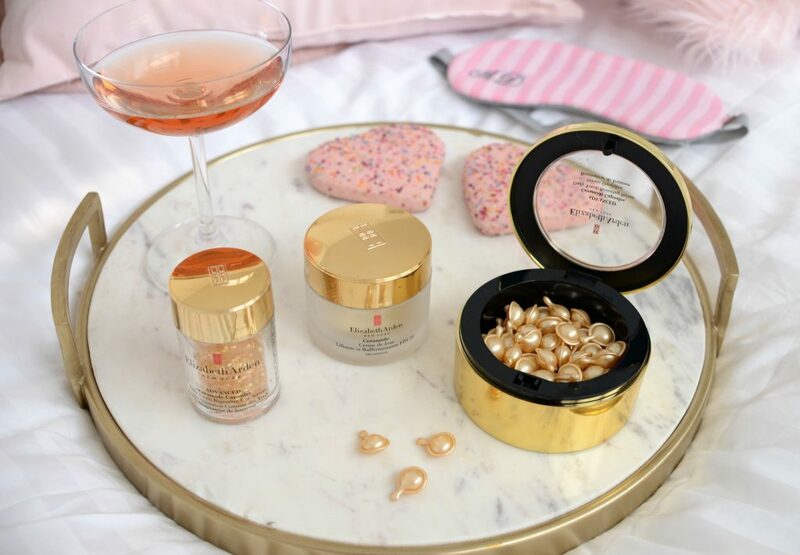 The star of my new skincare routine, is the Elizabeth Arden Ceramide Capsules Daily Youth Restoring Serum. These tiny little pods are jammed packed with a unique blend of botanicals and Tsubaki oil, enhanced Ceramide lipid complex and sea fennel extract and phytosphingosine, to help smooth, firm and moisturize the skin. 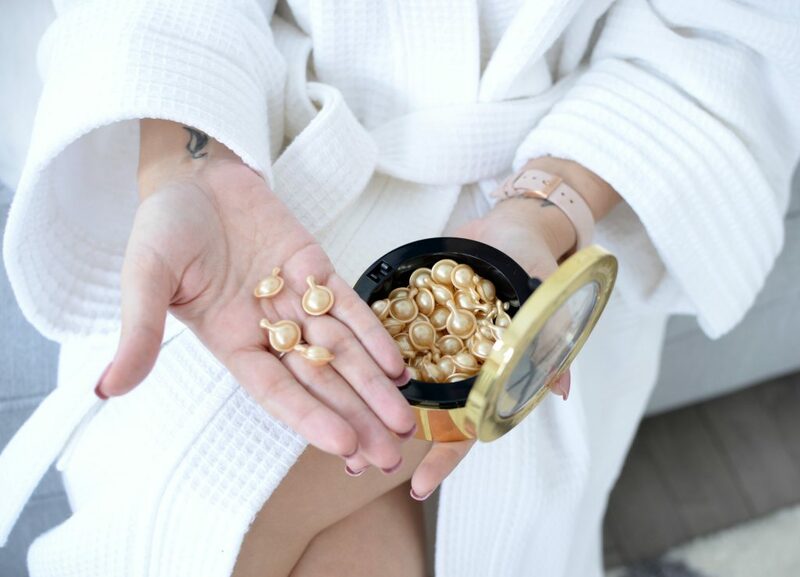 These powerful anti-aging capsules help to create a healthy, luminous and youthful appearance in as little as two weeks. Now, I know what you’re thinking…there’s no magical serum that can transform your skin in only a few short weeks, but I’m here to tell you, you’re wrong. 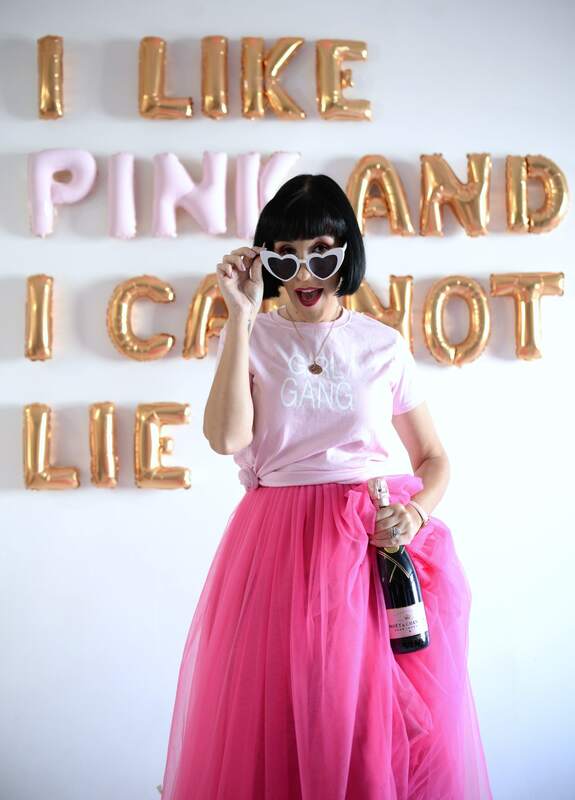 I didn’t believe it myself when I heard other bloggers, Youtubers and influencers talking about it last year, which is why I was excited to take the two-week challenge. Each pea-size pod promises to help moisturize, target fine lines and re-texturize the skin. It does this by trapping in the moisture and keeping the daily grime, that causes premature aging, out. 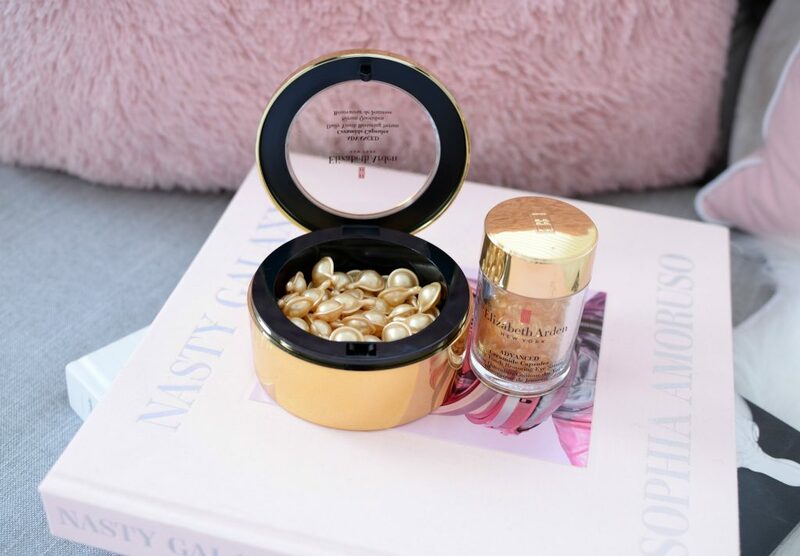 Now I’m not sure what I was expecting, but when you break open the Elizabeth Arden Ceramide Capsules Daily Youth Restoring Serum pods, they have a fairly thick consistency… in a good way. As soon as you apply and blend it into the skin, it immediately goes to work, deeply penetrating the skin’s surface for all day and all-night hydration. I’m not one to get too excited after only a few short days of testing out a product, as I know it takes time to see results, but after the very first night, I saw a difference. I woke up to softer and smoother skin. By day 3, I was noticing less dry patches and that my foundation was applying almost effortlessly, with no dry flakes. By the end of the first week I was noticing a healthy glow and enhanced hydration. Before the end of my second week, my skin was looking firmer and more youthful. Now in terms of reducing wrinkles, I can really testify to this (as I get Botox), but since it helps to plump up the skin, I can see this helping with fine lines? I love that it leaves no sticky, greasy or oily residue behind, allowing me to use it in the morning before my foundation. I have no fear of it separating my foundation, nor do I see any pilling or balling when combined with other products. It retails for $98. Speaking of a flawless makeup look, your makeup only applies as seamless as the skin underneath. 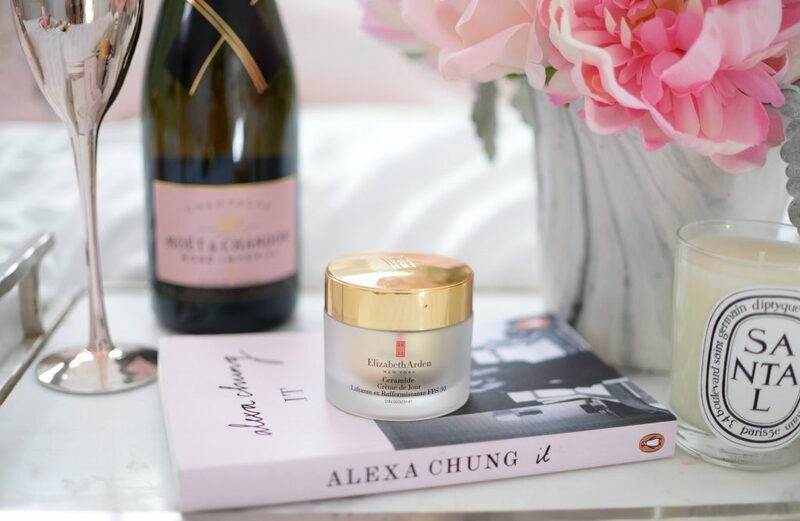 To keep my skin hydrated, and protected from the sun all day, I’ve been reaching for the Elizabeth Arden Ceramide Lift and Firm Day Cream SPF 30. 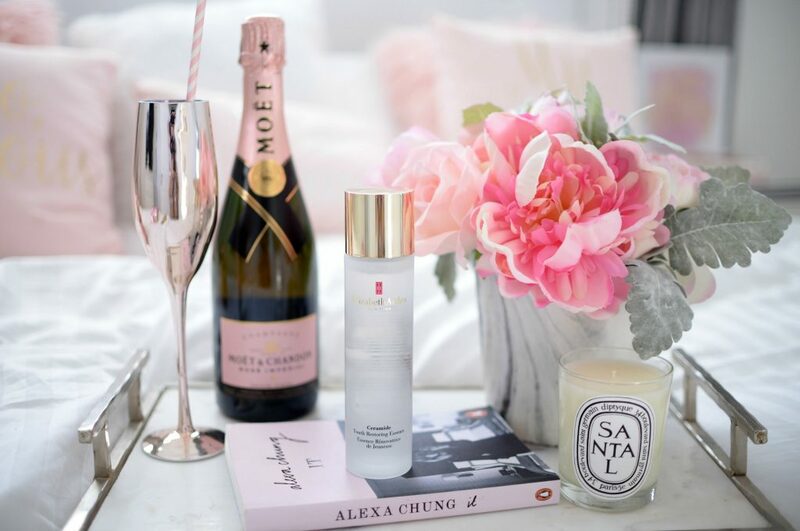 This anti-aging moisturizer not only plumps up my skin, hydrates and firms, it also shields it from harmful UV rays that can cause more damage to the skin. Its unique blend of peptides and collagen instantly goes to work smoothing the appearance of surface lines and targets wrinkles overtime. Because it’s the winter, and because I have dry skin, I went for the ultra hydrating cream version, but the brand also offers a lighter lotion formula as well. Elizabeth Arden Ceramide Lift and Firm Day Cream SPF 30 helps to nourish, hydrate, energize and calm my skin, while keeping it supple, refined, smooth and radiant. Its almost whipped- moussey texture is extremely soft and silky smooth and applies like a dream. It fully absorbs into the skin within a few minutes, leaving behind no greasy or oily residue. It’s extremely lightweight on the skin, yet highly hydrating. I only need a dime size amount to cover both face and neck and it does an amazing job at refreshing the skin in the morning. This daytime moisturizer keeps my skin feeling refreshed and hydrated the entire day, with a slight brightening effect. It combats dullness, while adding a touch of radiance to my lifeless complexion. It retails for $55 for 50ml. As much as I like the ease and convenience of a cleansing cloth or micellar water, both never fully cleanse my skin of makeup. I also find them quite drying, which is why cleansing oils tend to be my Holy Grail when it comes to makeup removal. For the most part, I thought all were created equally, until I started using Elizabeth Arden Ceramide Replenishing Cleansing Oil. Not only does it cleanse my skin of daily grime, dirt and oil, it does an excellent job of breaking down full-coverage foundation, long-wearing eyeliner and even waterproof mascara. It’s formulated with essential lipids, Omega 3,6 and 9 and vitamin E, to help nourish and hydrate the skin. 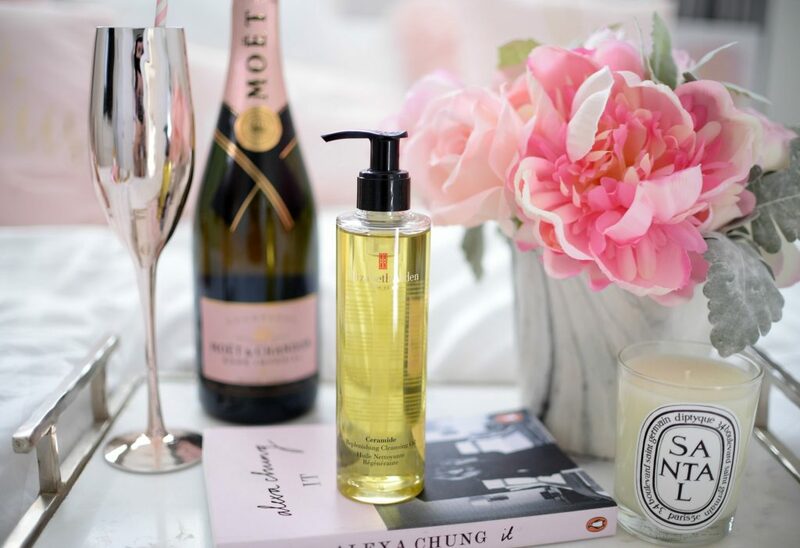 Elizabeth Arden Ceramide Replenishing Cleansing Oil, of course, can be used on dry skin, by pumping out a drop or two into the palm of your hands and rubbing together before applying to the skin. It really shows off its magic when used in conjunction with water. It instantly transforms into a milky consistency, immediately dissolves all traces of impurities and makeup. It leaves the skin squeaky clean, soft and smooth. Not only does it help cleanse the skin, it helps revitalize for a more radiant, nourished, refined texture. It rinses clean away with no oily residue or greasy film, perfect for those that are prone to breakouts as it won’t clog pores. Unlike other makeup removers that leave skin feeling parched, this helps to moisturize and leave skin feeling soft and smooth. It has a light and refreshing scent that isn’t too strong or overwhelming. Elizabeth Arden Ceramide Replenishing Cleansing Oil is the perfect makeup remover for dissolving and melting away waterproof mascara. No need to tug or pull on your delicate eye area, nor will you have the fear of it stinging or irritating the eyes. Since there is no oily residue, you won’t have to worry about your eyes becoming blurry. It does an amazing job at removing all types of makeup with only the smallest amount and perfect for those with dry skin. It retails for $45 for 195ml. Unlike other toners that trigger extra oil production, causing blemishes, the Elizabeth Arden Ceramide Purifying Toner seems to instantly unclog and tighten pores, while keeping my skin incredibly hydrated. Its lightweight formula provides a squeaky clean and completely smooth texture, while refreshing and moisturizing the skin. 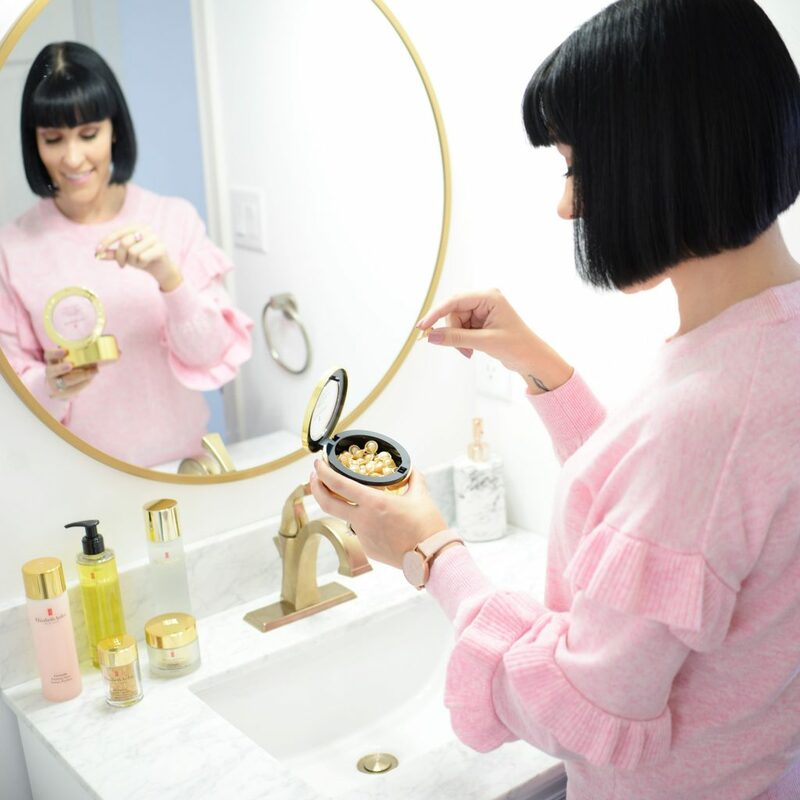 During the cold winter months, my skin tends to get extra dry, itchy and flaky, but with the help of this toner and the Advanced Ceramide Capsules Daily Youth Restoring Serum, my skin is no longer red and irritated. Its visibly smoother, more toned and less congested. It retails for $38 for 200ml. And the giveaway winner for her own bottle of Elizabeth Arden Ceramide Capsules Daily Youth Restoring Serum is Sherri Kellestine!